Keep your holiday shopping in Marlboro County this year and enter to win BIG while supporting local businesses in the process. 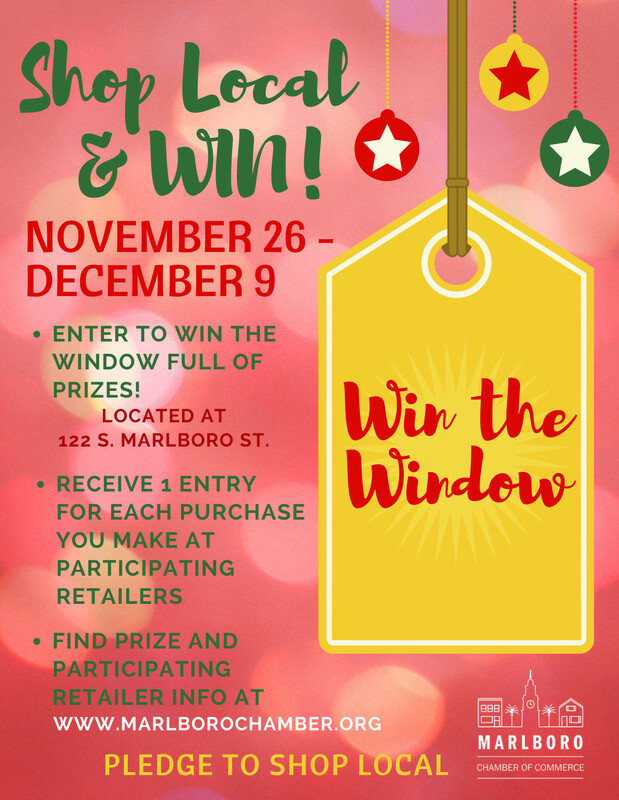 Earn chances to win a window filled with over $600 in merchandise and gift certificates from participating Marlboro Chamber of Commerce businesses! This contest is presented by the Marlboro Chamber of Commerce. The prize window can be viewed at the Marlboro Chamber of Commerce, located at 122 S. Marlboro Street, starting on November 25th. From November 26th - December 9th, shoppers will get one entry for every purchase they make at a participating Marlboro Chamber of Commerce business. Shoppers are required to request their tickets at the time of purchase. Participating businesses will have tickets available at the time of your purchases and a ticket box to collect all of the tickets for the drawing. Shoppers must submit all tickets to a Win the Window jar before 4:00 pm on Tuesday, December 9th. There is no limit to how many times you can shop to enter. The more you spend in Marlboro County at participating businesses, the more chances you have to win the window full of prizes! The drawing for the winner will take place on Tuesday, December 13th at 5:00 pm at the Community Tree Lighting Ceremony following the City of Bennettsville Christmas Parade. You are not required to be present to win. Win the Window Contest only includes winning the prizes listed below - it does not include props used in the window to display the prizes. Must be 18 years of age to win & you must be 21 years of age to claim alcoholic beverages. You can contact the Marlboro Chamber of Commerce with any other questions about the contest at 843-535-8184.